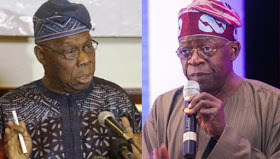 Former President Olusegun Obasanjo says he dont knows the position that Asiwaju Bola Tinubu currently holds at the All Progressions Congress. Obasanjo said this during a program titled "The Talk," which aired on a YouTube channel called "Voice of the People." The former president was asked to identify the names of certain political figures in the country. He identified Muhammadu Buhari and Prof. Yemi Osinbajo as Presidents and Vice Presidents, while also identifying Senator Bukola Saraki as Senate Chairman. When asked to identify Tinubu, he said, "Oh, Bola, Bola is said to be the APC leader, and I do not know the position of his leadership when you and I talk." In the interview, apparently recorded before he publicly supported People's Democratic Party presidential candidate Atiku Abibakar, the former president said he had hoped Atiku would become his successor as president in 2007.